A leave of absence (LOA) is an extended period of time off from your job. Depending on the organization, you may simply be able to ask for time off from work. Or, there may be a formal process you need to follow to get approved for a leave. Other than for leaves covered by The Family and Medical Leave Act (FMLA), military duty, jury duty, and some other particular circumstances, your employer is not required to approve your request – nor are they required to provide paid personal leave. Regardless of why you're asking for leave, it's important to approach the request properly to create a minimal backlash and maintain your good standing at work. Requesting and obtaining a leave of absence when you work in a casual environment can be as simple as saying to your boss, "I need a leave of absence. Would it be possible to take a leave from work for two months?" In more formal workplaces, you may need to frame your request per company policy. The company may have guidelines for who is eligible for leave and when and how often leave of absence can be taken. Before submitting a request, be sure to familiarize yourself with your company's leave-of-absence policies. You should also have a well-practiced explanation on hand. Make a decision before broaching the topic about what your next move will be if your request is turned down. Here are some tips for requesting a leave of absence, with letter examples you can use to get ideas for your own correspondence. Know Your Rights Prior to Scheduling a Discussion With Your Employer: Research your organization's policy regarding leaves of absence and determine if your situation is addressed under the policy. The Family and Medical Leave Act (FMLA) requires employers to provide employees with time off (without pay) for serious family and personal medical conditions requiring care, as well as the birth, adoption, or placement of a child into foster care, and emergencies arising from a family member’s active military duty. Employees are also entitled to a leave of absence for jury duty or if they are called into active military duty. Employers are not, however, required to give you a leave of absence simply because you want one. Provide Your Employer With as Much Lead Time as Possible Prior to the Beginning of Your Leave: Advance notice will make it easier for your employer to fill the void left by your departure and make them more likely to accept your request. 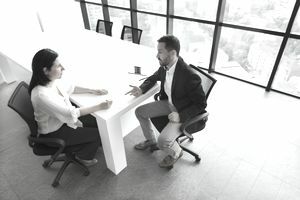 Start the Process With Your Immediate Supervisor: You don't want your direct supervisor to hear the news from Human Resources or upper management first. Additionally, don't mention your desire to take a leave of absence to coworkers until you clear it with your manager. Word can spread fast in an office and for the best response, ​you should talk to your immediate supervisor first before broaching the topic with anyone else. Outline Your Request in Writing Prior to Meeting With Your Supervisor so He or She Can Digest Your Request Before a Discussion: You can submit your request via email prior to your in-person meeting. Be sure to include the reasons for your request, and clarify anything you are willing or able to do to ease the transition including training your replacement, writing a procedure manual, and fielding questions while you are gone. Review these tips for sending professional email messages and letters before you start your own letter. Don't Provide Any Legal Imperatives With Your Initial Request: Let your employer feel that they are in control and can enable you to take the leave out of good will. If necessary, you can invoke any legal protection later on with the assistance of your Human Resources department, but legality should not come up in your first request. Schedule a Face-To-Face Meeting With Your Boss at a Time When He or She Is Under the Least Stress If Possible: If you ask for a leave of absence when your boss is feeling overwhelmed, he or she may give you a straight-out "no way." On a day when things barely seem to be running with all hands on deck, a leave request won’t find a receptive audience. Be tactful and patient. Yes, it’s important to provide as much lead time as possible—but you should also be strategic about the best time to bring up your request. If a Partial Leave Will Enable You to Meet Your Goals, Explore the Feasibility of Reducing Your Hours to Part-Time: In some cases, a partial leave is preferable for all involved. A part-time proposal may be more acceptable to your employer, and you will maintain some cash flow. Along the Same Lines, Consider Whether a Temporary Work-From-Home Arrangement Rather Than a Full Leave Might Be Appropriate for Your Situation: For example, if you need to care for a sick family member, telecommuting might be ideal for you. Or, perhaps you work from home for four days out of the week and come in one day for a weekly check-in or for meetings. Have a variety of alternatives in mind that you can lay out if your employer is open to considering other options. Indicate an End Date, If Possible in Your Situation, so Your Supervisor Has the Comfort of Knowing When You Will Return: Your request will likely go over much better if you can provide some idea as to when you'll return. Even if you can't provide an exact date, it's still better to give your employer a general timeframe of how long you expect to be gone. Plan Your Finances Prior to Filing Your Request: Make sure you can pay your bills without the normal cash flow from your job. You will usually be able to withdraw a request for a leave for financial reasons, but you should avoid the embarrassment if possible. Meet With a Human Resources Representative to Explore the Implications for Your Benefits If You Take a Leave: If you are taking a leave for reasons covered by the FMLA, your employer will be obligated to continue providing health care coverage. However, you will still be responsible for the same employee contribution to the premium that you paid prior to your leave. Plan Your Next Steps Prior to Submitting Your Request: If your employer says no, will you continue with your job, or will you need to leave permanently? The next steps will vary significantly depending on your reasons for the leave, and if you're filing the request out of "want" or out of "need." Either way, you should have some idea in mind as to how you'll respond if your request is denied. According to the U.S. Department of Labor, The FMLA law covers employees who have worked for their employer for at least 12 months; have worked at least 1,250 hours during the year prior to the start of their leave; and work at a location where at least 50 employees are employed at the location or within 75 miles of the location. Covered employers include public agencies, including state, local, and federal employers, and schools, along with private sector employers who employ 50 or more workers for at least 20 work weeks in the current or preceding year. Your employer may also provide medical leave. Check with your manager or human resources department for details and eligibility information. This leave of absence example letter provides a written request for a leave of absence from work for personal reasons. The letter offers to answer questions while the employee is on leave and provides a return date for returning to work. I would like to request a thirty-day leave of absence for personal reasons. If possible, I would like to leave work on July 1 and return on August 1. If approved, I will be traveling during this time period, but I would be glad to assist with any questions via email or phone. I would like to request a leave of absence for medical reasons. I will be having hernia surgery on September 1 and expect to return to work approximately three weeks later. I can provide written documentation from the surgeon, if necessary. Do you need to request a leave for a different reason? Review more examples of letters requesting a leave of absence from work for a variety of reasons. Be sure to tailor your letter to your personal and professional circumstances, as well as your company's leave policy.